Recently the semicolon has become a power symbol across popular culture. Utilized by survivors of trauma and mental illness as a sign of new beginnings, that the story is not over. What is a semicolon? Dictionary.com defines the semicolon as a punctuation mark (;) used to join two independent clauses in a sentence. Basically a semicolon combines two separate and complete thoughts into one sentence. Two phrases connect to create one story. I particularly identify with the idea that the story is not over. As a survivor of mental illness I has tried more times than I can count to end my life, to destroy my being. Yet I am still here. I believe that I am still here because God wants me to be. No matter what I tried to do or how many times I tried, there was always somebody to stop me. A phone call, a friend stopping by unannounced, my parents coming home before they should have, a friend literally pulling scissors from my hands as I tried to stab myself. All examples of times interruptions that have continued my life to this point. God wants me alive because my story is not over. As Christians we insert a semicolon into our lives when we accept Jesus into our hearts as Lord and Savior. When we do this the Bible tells us that in Christ we a washed clean, a new creation. “Therefore if any man be in Christ, he is a new creature.” 2 Corinthians 5:17 (KJV). The hold of sin and death in our lives is finished, as Jesus hung on the cross with his final breath he said “It is finished.” John 19:13. The finished that Jesus is referring to is much greater than that of the end of his life. On Cavalry Hill, Jesus paid the ultimate sacrifice as the Lamb of God, He absolved everyone to the end of days for all the sins they would ever commit. So rather than being required to pay penance or make sacrifices we must only come to God with humble hearts and say, “I have sinned, please forgive me. Help me that I may not make the same mistake again.” By accepting Jesus into our lives we get our semicolon. Prior to the moment in our lives when we accept Jesus we all have a story that is being told, with God’s forgiveness comes a blank slate to write our story a new. You just got to hear a brief part of my story before Christ and even part of it with Christ. Because despite what some people may tell you, a life with Christ is not always bunnies and rainbows. Christians are real people with real problems and while God absolves us of our past sins and the grip of death in our lives is Finished; that part of our story is still there. That part of our story becomes our testimony, going forward from there we get to write our new story. We get our semicolon. The beauty of the Cross and of Jesus’ sacrifice is that we are not limited to one semicolon. Every time we choose to return to the Cross and recommit our lives to Christ, we receive a new semicolon. Every time we ask honestly and earnestly for God’s forgiveness, we receive a new semicolon. This does not give Christians the license to do as they please because God will forgive them, rather it serves to provide assurance that your story is never over. 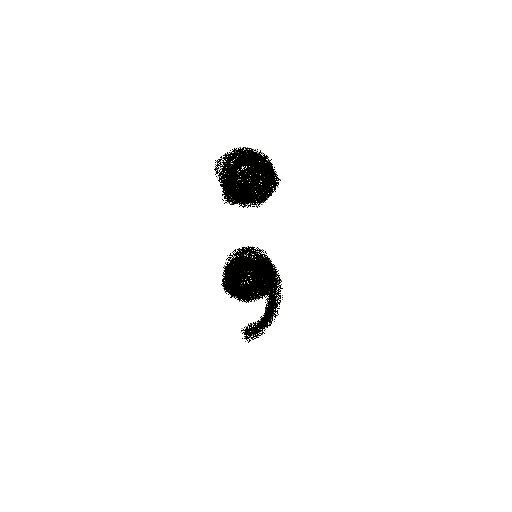 No matter what your story has held up to this point God will always accept you and provide you with a semicolon. Your past is Finished, the hold of sin in your life is Finished. You are a new creation; blessed by God and your story is just beginning.